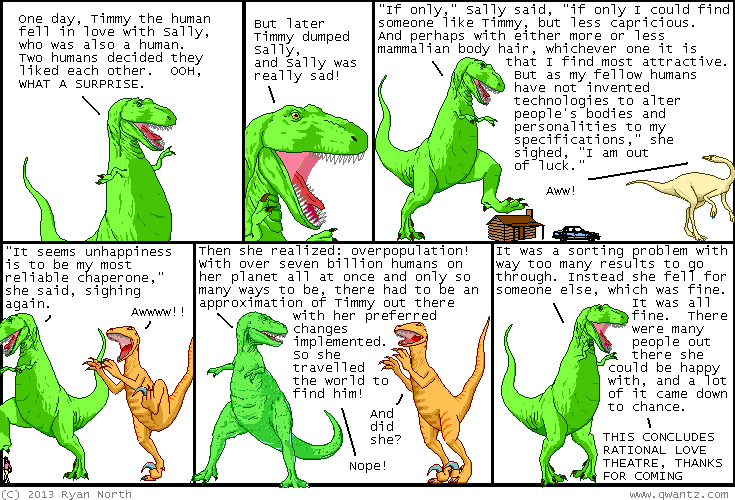 Dinosaur Comics - August 22nd, 2013 - awesome fun times! August 22nd, 2013: HEY SPEAKING OF BODY HAIR, yesterday I shaved for the first time in several years! This is exciting for me but boring for most other people, so here's the wonderful Bee and Puppycat so you don't stop reading these posts down here due to extreme hair-based boredom. One year ago today: short story: someone gets to the oceanic pole of inaccessibility, someone else is there, they both fall in love but get back to dry land and the magic is gone. sorry, that was a sad short story. it happens sometimes.